One of the most stressful and difficult situations that you can encounter following a work related injury is to receive a denial of your claim for Workers Compensation benefits from your employer or their insurance carrier. Often, we receive calls from people who are seriously distressed after they have become disabled because of a work-related injury and thought there would be no problem with their claim being approved. Many are now in desperate need of workers’ compensation benefits to pay their bills, but have been notified that their claim is being denied. Unfortunately, despite what many people may think, a workers compensation insurance carrier will not just take your word at face value in deciding whether to pay you benefits. In fact, in most situations, they are looking for reasons to deny the claim, not reasons to accept it. 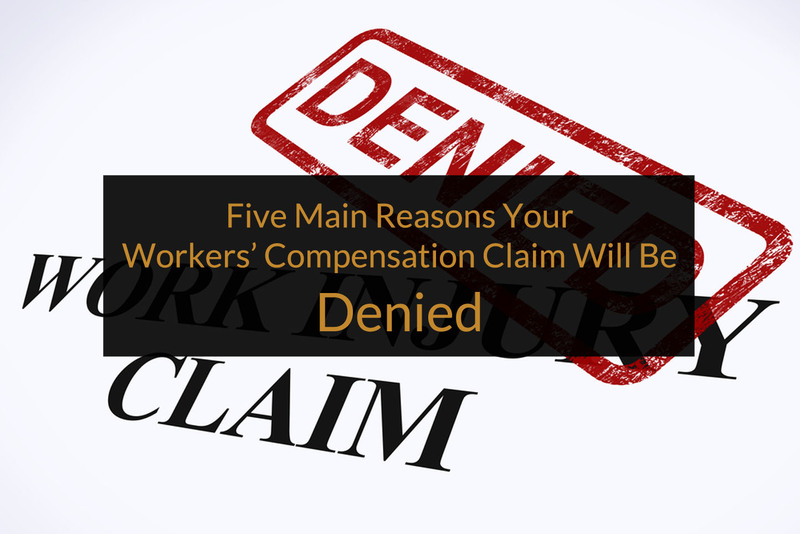 Based upon our decades of experience in handling workers compensation claims, we decided to list five of the most common reasons that a claim is denied, with some suggestions on what to do to avoid this being a reason for a denial if you are injured at work. Failure to promptly notify your employer of the injury. Under the Pennsylvania Worker’s Compensation Act, an employee has up to 120 days in which to report an injury. However, failure to report an injury promptly is often a reason that a workers’ compensation claim ends up being denied. Often, we see clients who sustain what they think is going to be a very minor injury, only to have it get worse over the next several days. When they then report that they were injured, the employer often is skeptical about whether the injury actually occurred at work, because it was not reported immediately. It is therefore always advisable, even with an injury that seems to be minor, to report it to your employer as soon as possible. Many employers even have employee policies that state all accidents are to be reported immediately, which is even more reason to report all injuries immediately. It is also helpful to document that you did report the injury, either by receipt of a copy of a written accident report (if your employer prepares one), or by some written follow-up by you confirming that you reported the injury, whether it’s through an email, text message or even an old-fashioned letter, as long as you keep a copy of it for yourself. Lack of medical support/documentation for your injury. When we are initially contacted by someone following a work related injury, one of the questions that we ask them is whether the physician that they have been treating with for the work injury has confirmed, in writing, that they have sustained a work-related injury and required treatment or need to be off work because of the injury. In many instances, the injured employee that we are speaking with simply does not know. Often, the doctors that are involved in treating work injuries are focusing on treatment, and not the paperwork that is necessary in connection with the claim. It is therefore a good idea to get something in writing from the doctor yourself, confirming that you are treating for work injury and that you have been removed or are restricted from work if that is the case. Pennsylvania law states that any condition that is directly caused by your employment, or that is aggravated or accelerated by an incident or activities at work, is a work-related injury. Despite this, if you have a pre-existing condition, such as a prior knee injury, and then you sustain a new injury to your knee, many times the insurance carrier will deny the claim and attempt to argue that your problem is related to the pre-existing condition. In this type of situation, it is always important to be completely honest about your pre-existing condition, and explain both to your employer and then the doctor that you treat with what has changed because of the work injury. You will need to get the doctor to document that your problem is due to the new event or activity that caused the problem, rather than the pre-existing condition. Whenever you report your work injury, typically your employer will ask you questions about how it occurred. When you then see the doctor, you will be asked similar questions. It is important that your answers remain consistent and accurate at all times. In particular, doctors’ offices often take a very abbreviated history of what occurred, and in many occasions record things inaccurately. Exactly how you were injured isn’t really important to the doctor in most situations, but it is critical to your legal claim. Make sure that you are very clear about how your injury occurred, and try to make sure that you find out what the doctor, or his staff, is writing down about your injury. One of the best ways to handle this is to be accurate in the patient intake form that most every doctor’s office uses with new patients. Also, do not be afraid to ask for copy of the forms that you fill out at the doctor’s office, so that there can be no question about what you wrote down if later you have a legal dispute about your case. If, at the time of your injury, you have an ongoing dispute or issue with your employer over some other matter, you are in the middle of the grievance, or there is a potential strike or plant shutdown where you work, the insurance carrier will deny all but the most obvious work related injuries. As we noted previously, insurance carriers will not take your word for things, and will be looking for some reason to deny your claim. If your employer suggests that you may have an ulterior motive for making a workers compensation claim, and your injury can be questioned in any way, your claim is likely to be denied. If you are proceeding without legal assistance in the early stages of your claim, you should never complain about or discuss issues related to your employment with the insurance adjuster that are unrelated to the actual injury itself. Even if you do everything possible to avoid giving the insurance carrier a basis for denying your claim, many legitimate claims are denied. We have been successfully representing people with claims of this nature for over 50 years. By doing what you can to eliminate additional issues from being part of your case, you improve your chances of success. Hopefully, these tips can help you to avoid inadvertently creating additional reasons why your workers’ compensation claim is denied. Think about it. What do you do when shopping for an automobile? Well, if you don’t tell the salesman exactly what you want and what you expect from your automotive investment, then you are not going to get what you pay for. Shopping for a lawyer is much like that. 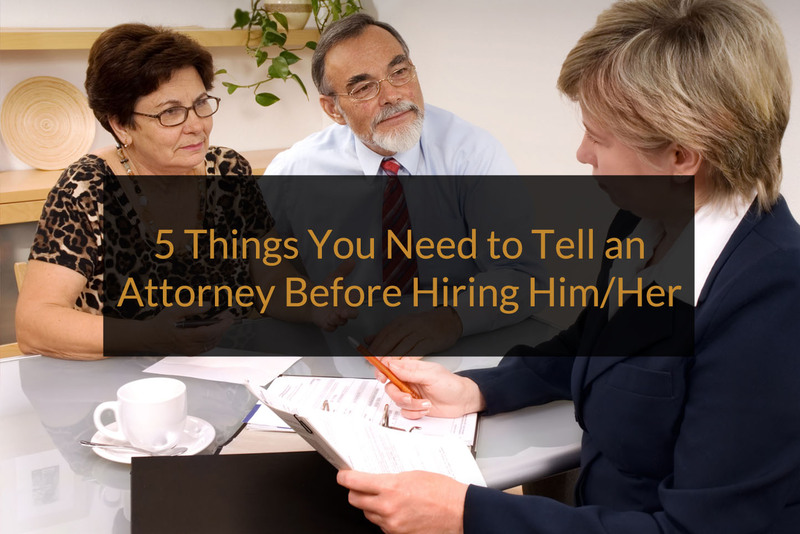 When hiring an attorney, it is very important that you, the prospective client, clearly express what your expectations are in the attorney—client relationship. Just like car salesmen, there are good attorneys and not so good attorneys. So, in order to protect yourself, the following is a list of things to tell an attorney up front before engaging their services. I expect my attorney to return phone calls in a timely manner. Unreturned phone calls can be corrosive to an attorney—client relationship. Although it is true that attorneys have more than one case, there is no excuse for phone calls that are not returned in a timely manner. At the very least, your calls should be acknowledged by a staff person if your attorney is not available. It is important before hiring an attorney to make it perfectly clear that unreturned phone calls or the inability to communicate with your attorney will not be tolerated. I expect my attorney to be accessible. Attorneys should make every effort to ensure that their clients have reasonable access to them for appointments. Access to an attorney is critical to a good attorney—client relationship. Although an attorney may be busy, time should always be made for individual clients. Your need for periodic updates and face to face meetings should be made clear before engaging an attorney. I expect my attorney to keep me well informed about my case. As the client, you have a right to know what is going on with your legal problem. In today’s world with instant communication via email and other technologic advancements, there is no excuse for failing to keep a client informed. Making sure that a prospective attorney knows that you want to be kept informed and discussing how you prefer to be updated (letter, phone call, e-mail, ) will go a long way to cementing a good relationship early on. I expect my attorney to prepare me properly if I have to testify. Occasionally, a legal problem will end up in court and may require you to testify. The ability to win a case often depends on your testimony. If it is clear from the beginning that your case is going to end up in front of a Judge you should put your prospective attorney on notice of the fact that you expect to meet with him or her well in advance of any hearing so that you can be properly prepared to testify. If your case is particularly complex, then multiple meetings may have to take place. However, in the end, it is very important that this be communicated to any attorney that you expect to hire. I expect my attorney to answer any questions that I might have in a timely manner. It is very important for clients to have peace of mind. This can only be accomplished when questions are answered by the attorney in a timely manner. Not having your questions answered as soon as possible can lead to unwarranted stress. Letting any prospective attorney know this up front will also help to cultivate a healthy attorney—client relationship. Client expectations are important. When shopping for an attorney you should never fail to advise that attorney as to what you expect in the relationship. We at Yablonski, Costello & Leckie strive to meet all of our client’s expectations no matter what they are. From promptly returned phone calls to accessibility to preparation to information to answering questions, we make sure that our clients know from the beginning that whatever their expectations are, we will meet them. If you are receiving workers’ compensation, it is possible that someday your case may end up in front of a Workers’ Compensation Judge (WCJ). If that occurs, you undoubtedly will have to testify. How you present yourself before a WCJ can mean the difference between winning and losing your case. 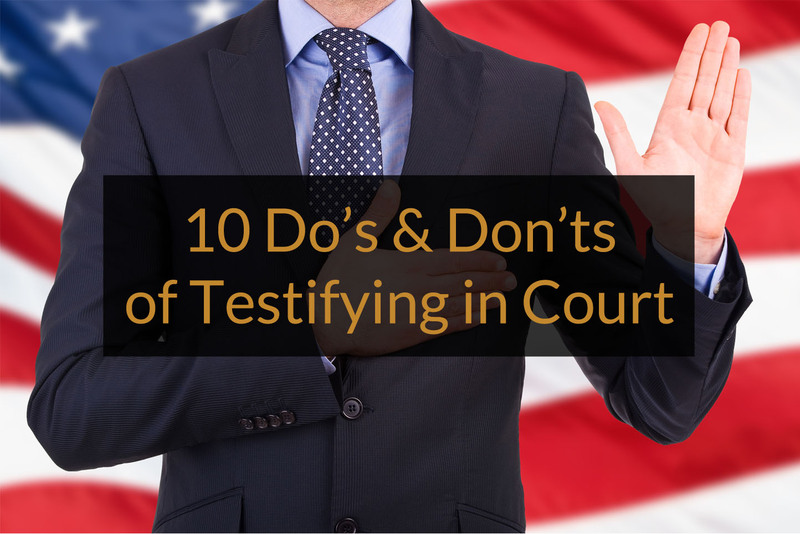 What follows are 10 Do’s & Don’ts on testifying in a workers’ compensation case. Answer the question. Although this may seem rather obvious, it is not uncommon to see witnesses failing to answer simple questions. Our advice to our clients is “just answer the question.” Don’t drift off into other subjects that have nothing to do with the question being presented to you. Don’t be evasive. Sometimes questions can be uncomfortable. Although all questions should be answered truthfully, answering an uncomfortable question can pose a problem. The point is that Judges can always tell when someone is being It is best to deal with uncomfortable questions head on with a straight forward direct answer. Be brief. In most instances, simple “yes” or “no” answers will suffice. Stick to the yes or no answers and you can’t go wrong. If more explanation is required, then feel free to explain but remember to be brief. Don’t talk too much. You don’t need a shovel to dig a hole. Often times witnesses bury themselves by talking too much. It is a natural tendency for people to want to talk about themselves and their injury when they get on the stand. However, sticking with our previous advice to just answer the question is still the best practice. Be direct. A firm straight answer is still the best way to handle any question. Don’t look away. When presented with a question, look your questioner straight in the eye and provide the answer. Studies have shown that people who look directly at their interrogator and answer questions firmly are almost universally believed as credible. If you don’t know the answer to a question say so. Often times questions require answers that go beyond the knowledge or recollection of a witness. There is nothing wrong with indicating that you do not know the answer to a question. It is better to admit that then try to bluff your way through an answer. If you don’t understand a question, then say so. Asking for a question to be repeated is not uncommon. This goes along with not answering a question if you don’t know the answer. Questions can sometimes be complex. It is better to ask for the question to be repeated then to try to assume that you understand what the question is and provide an incorrect answer. Don’t be fidgety. Body language is often a dead giveaway to the truthfulness of a witnesses’ testimony. There are many studies that indicate that certain gestures, especially with ones’ hands, can be a dead giveaway as to whether or not the witness is telling the truth. It is very hard not to fidget when testifying. If you are fearful of fidgeting, then it is best to hold something in your hands which will prevent you from using them. Wear proper attire. There is nothing more that can add to a person’s credibility then to present a good image before the Judge. This can easily be accomplished by wearing clothes that are proper for courtroom testimony. For men, a suit and tie is For women, business dress. Coming to court in casual (or very casual) attire can be misinterpreted as showing a lack of respect. This can affect how a Judge views ones’ testimony. It is essential that witnesses who testify in a workers’ compensation case, or any case for that matter, should be extensively prepared. This requires time spent with your attorney getting ready to have you testify. Reviewing records and previous transcripts of testimony from other witnesses, including doctors, etc., can help to prepare you for questions that may be presented to you. Remember, it is not enough to just tell the truth. What is important in testifying is that you must be believed. Anyone can tell the truth. But not everyone can be believed. To be believed you have to be credible. And by following these simple rules your credibility will be enhanced if you are required to testify in court someday.